Emojis are emoticon symbols that represent facial expressions, concepts, and ideas like food, activities, emotion, and feelings. The use of emojis as part of text communication has significantly increased with improved mobile technology and the popularity of social media platforms like Twitter. Researchers in Slovenia have constructed an ‘Emoji Sentiment Ranking’ by analyzing the emotional content behind 751 of the most frequently used emojis in over 1.6 million tweets from a population of 83 human annotators in Europe. They assessed whether the emojis used were negative, positive, or neutral from the sentiment of the tweets in which they occurred. Annotators assigned each emoji with a numerical value between -1 (negative) and +1 (positive). A value of 0 was considered neutral and the average score for each emoji was called the ‘sentiment score’. The most popular emojis used in tweets were overwhelmingly positive with an average sentiment score of +0.3. The most popular negative emojis were sad faces, while the positive emojis included happy faces, hearts, and a party symbol. Neutral emojis like yin/yang and a bomb hovered around a score of 0 and interestingly, the emojis of a face with cold sweat and crying face were bipolar, having both negative and positive values. Most emojis were grouped together and appeared on average near the end of the tweeted message. The research group also examined whether tweets with emojis were perceived as more emotionally loaded. 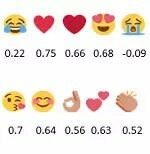 It was discovered that tweets with emojis had significantly different sentiments than tweets without emojis, and that the presence of emojis made tweets significantly more positive (+0.37) than those without them (+0.11). The Emoji Sentiment Ranking is available to the public and its data will be a valuable resource to those who are interested in the computational study of people’s opinions, sentiments, and attitudes. Kralj Novak P, Smailović J, Sluban B, Mozetič I (2015) Sentiment of Emojis. PLoS ONE 10(12): e0144296. doi:10.1371/journal.pone.0144296. Published Dec. 7, 2015.